To illustrate, we’ll totally punt the issue of complexity, and assume there is no limit to it. Metro is equipped with omniscient fareboxes and farecards that can implement any fare policy that we can imagine. So which of these models is a “fair” framework for fares? Ability to pay: each boarding is a fixed, tiny percentage of your income. This will make riding the bus massively uneconomic for many people. If it’s a pass from a big employer — look out. There is a strong financial incentive to overserve rich neighborhoods and underserve poor ones. Time on the bus: This penalizes people suffering through milk runs, and incentivizes Metro to make buses slower. Distance Traveled: This penalizes long-haul freeway expresses that may be cheaper to provide than local milk runs. Cost of Service: Each bus trip’s cost is the cost of service of the minutes you are on the bus, divided among all the passengers in that interval. Riders on long and agonizing routes, and those traveling at odd hours, are most penalized. Cost of driving: Trips to places where parking is expensive, and long enough to take a lot of gas, are more expensive, thus extracting maximum revenue from economically rational riders. Congestion Pricing: Charge people more when capacity is at a premium. Buses, in particular, become much less efficient when overcrowded. Time Penalty Over Driving: Give riders a break when the bus is massively slower than driving, soak riders that are whizzing by stopped cars. In general, you would generally get a mild rebate for having to transfer. Maximize Revenue: There is a sweet spot where the fare – ridership product is at a maximum. Find the spot and use it to put as much service onto the road as possible. Maximize Profit/Minimize Loss: Truly running Metro like a business would create many outcomes offensive to those concerned about social justice and economic opportunity. Many of these values come up in a discussion of system fares as if they are all the same thing, but they lead to vastly different conclusions. Metro’s current system nods to several of these items while trying quite hard to be simple. 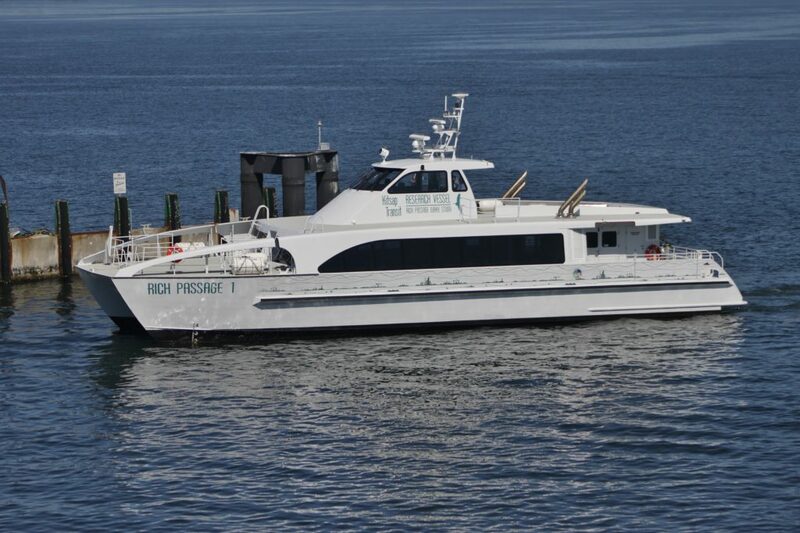 ORCA Lift, youth, disabled, and senior fares address ability to pay. Peak fares address Cost of Driving and Congestion Pricing. The two-zone structure is a proxy for time and distance. We can all agree that it does all of these things haphazardly. Meanwhile Link fares simply reflect ability to pay or Distance/Time (which amount to almost the same thing for traffic-separated transit). So when you’re providing Metro with public input, please think hard about what you think is important, and what you’re giving up in pursuit of that objective. The Seattle Times wants your neighborhood arterial to look like this. Photo by Bruce Englehardt. In recent years, the Seattle Times has published many editorials and columns skeptical of transit, or any transportation mode except private cars. STB hasn’t usually responded, because events have shown amply that every day the Times gets more out of step with citizens’ increasing desire for alternatives to sitting in traffic. And the Times gets credit for consistently excellent news coverage of transportation topics, led by ace reporter Mike Lindblom. But the Times’s latest ($) finally warrants a response, because it distills so many myths and bad ideas about transportation into a few words. The idea is not to get into a fight with our local paper, but to explain why transit investment is the only way to free people from congestion. The Times’s core request — to provide so much capacity for car traffic that a complete closure of I-5 would have little effect on car travel times — is geometrically impossible. Worse, any attempt to make it happen would cause profoundly destructive consequences for the city and its residents. And the reasons (below the jump) show exactly why support for transit, not more car capacity, is the best way forward from our congestion woes. It hasn’t really snowed around here since Seattle won its only Super Bowl nearly 3 years ago. When it snows and sticks, our region has a deserved reputation for basically falling apart, like the multi-day Snowmageddon of November 2010. Paltry amounts of snow bring us to a standstill, and there are many plausible reasons: the rarity of storms, icing due to multiple freeze/melt cycles, a dearth of snow tires, a street grid built for rain (steep and straight instead of switchbacks), lots of poorly-suited articulated buses, and a generally fragile road network full of chokepoints. With snow in the forecast for Monday and (especially) Wednesday, it’s a good time to refresh your knowledge of transit snow operations in Seattle. The first thing you should do is sign up for alerts. Metro, Sound Transit, Community Transit, Pierce Transit, and WSDOT all provide thorough information on road closures and reroutes. Being a Twitter user often gives you a leg up too; follow @seattledot, @kcmetrobus, @SoundTransit, @MyCommTrans, @PierceTransit, and @wsdot_traffic. 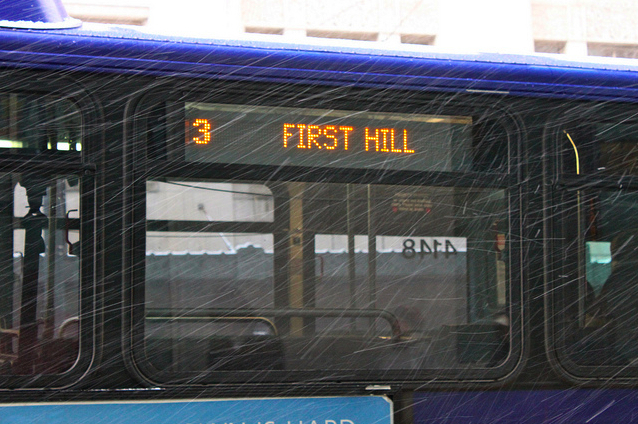 First Hill: no service west of Broadway. Trolley routes such as #2/3/4/12 detour all the way down to the International District. Queen Anne: No routes travel up the Counterbalance, with routes 2/13 getting a tour of Kinnear/10th Ave W along the way instead. Capitol Hill/Central District: Route 8 is basically an entirely different route, using 8th, 9th, Pine, and Union between South Lake Union and the Central District. Route 11 skips the steepest part of Madison east of 23rd. Routes 10, 48, and 49 operate normally. SE Seattle: Link usually hums along normally, and Route 7 runs normally except skipping the Prentice Loop. Routes 106 and 107 skip Skyway, staying along Lake Washington between Renton and Rainier Beach. NE Seattle: No service on NE 65th street east of 35th Ave NE. 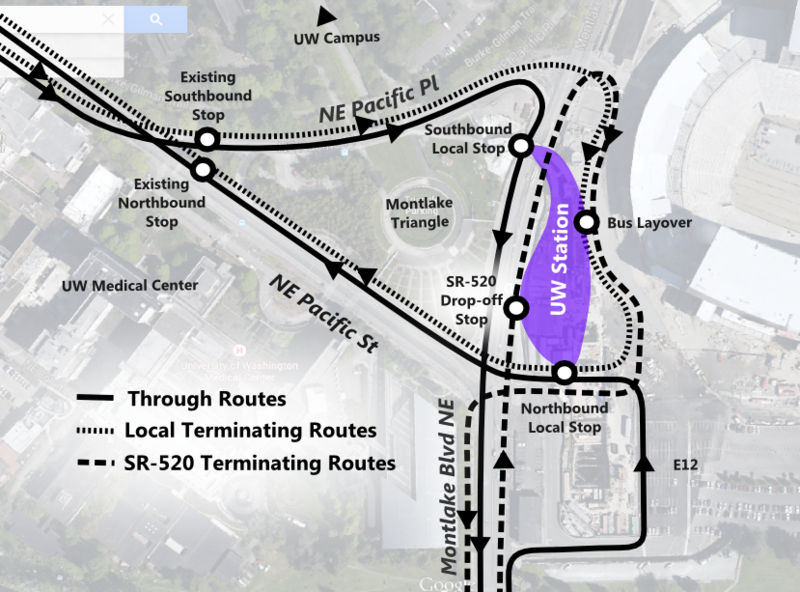 There is a convoluted shuttle system for Wedgwood and Ravenna, and new routes such as Route 62 detour all the way to UW Station. West Seattle: All routes skip the Viaduct and the high bridge, using 1st/4th and the Spokane Street Bridge instead. 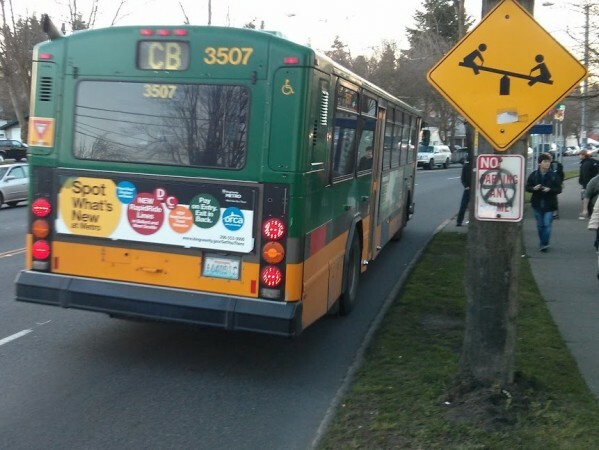 NW Seattle: The least disrupted area in Seattle, most routes operate normally. Exceptions include Route 5 (no Fremont Ave) and Route 26 (no NE 40th St). 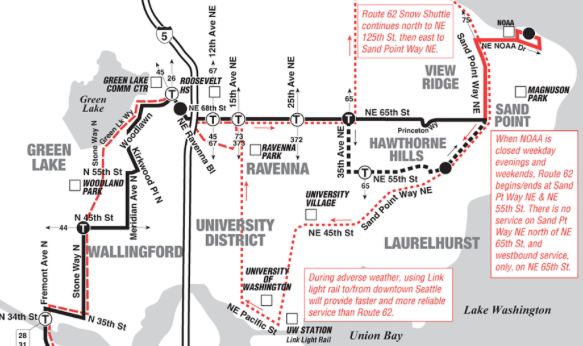 In 2010’s Snowmageddon, Link was the only mode that didn’t fail, With the ULink extension, Capitol Hill and UW riders can now join the ranks of the snow-immunized. In all likelihood this potential storm will fizzle out as others have, either skipping Seattle by retreating north to the Convergence Zone, or yielding a meager snowfall that immediately melts on warm roads or is washed away by rain. But once in a while things actually get messy, and with some prior planning you can be ready when it does. With the confluence of Mariner and Husky season looming, Mike Lindblom reports that Sound Transit is looking to beef up “mega event” service beyond it’s already-boosted weekend standard of 3 cars every 10 minutes. Sound Transit would do this by running weekday peak frequency but inverting the baseline, with twelve 3-car trains joining seven 2-car trains. During regular peak service today, twelve 2-car trains are the baseline, supplemented during peak by seven 3-car trains. Much has been made of Link’s railcar shortage and ability to run longer trains for events. Though the opening of Angle Lake Station on September 24th will not change schedules or frequency for existing stations, it will add one new trainset to the rotation, reducing Sound Transit’s flexibility further. 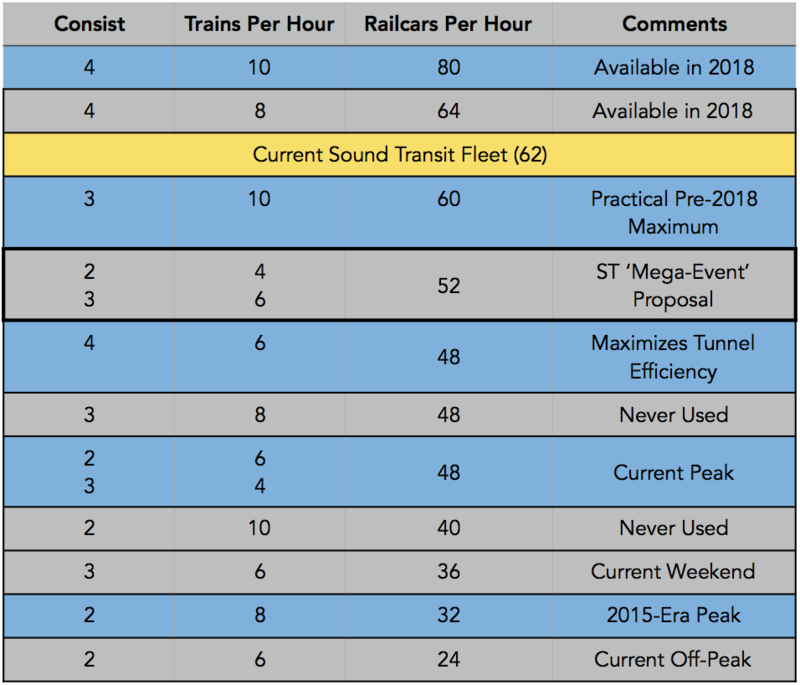 Prior to the delivery of next generation railcars in 2018-2019, Link has only 62 railcars, and Sound Transit is wisely being conservative about lifecycle maintenance. A Board report last month showed that while Link is sometimes uncomfortably crowded, the current service provision is running well within capacity limits. In a fleet of 62 cars, our current peak service uses roughly 77% of our railcar capacity (48/62), weekends use 58% (36/62), and weekday off-peak uses 39% (24/62). Sound Transit’s “mega-event” proposal would stretch utilization to its furthest yet, or 84% (52/62). And this is just my calculation based on active service needs. Allowing for layover, padding, and operator breaks further reduces flexibility. What’s the most Sound Transit could possibly do? Before the 2018-2019 delivery of new rail cars, Link’s maximum capacity would likely be 3-car trains every 6 minutes for 97% utilization (60/62). So at 84% utilization, it’s clear that with this weekend ‘mega-event’ proposal, Sound Transit is taking the issue seriously and will stretch its fleet within reasonable maintenance limitations. When these big event days are on weekends, Sound Transit has more flexibility due to the availability of bus-rail tunnel slots in the Downtown Seattle Transit Tunnel. Were a massive convergence of events to happen on a weekday, when tunnel bus commuters still need reliable service, I’d suggest that Sound Transit look into a different “tunnel maximizing” level of service. Because every Link train takes up one tunnel slot – buses and trains are prohibited from sharing a platform – maximizing weekday tunnel capacity would involve running longer trains at lower frequencies. 4-car trains running every 10 minutes would provide the same capacity as our current peak service, while using 33% fewer tunnel slots. What do you think? When large events occur on a weekday, would you rather have higher frequency, even if it meant more tunnel delays? Or would you rather have more reliability, but a longer wait? UW Station: At 9,200 boardings per day, UW Station has the 2nd most riders, and could soon surpass Westlake this fall as the busiest station in the system. Look for it to carry a proportionally heavier burden as tourist numbers fall off at Westlake and UW goes back into session next month. Capitol Hill: At a healthy 6,000 boardings per day, Capitol Hill comes in 4th place behind Westlake, SeaTac, and UW. It will be interesting to see if Capitol Hill has a lower ridership ceiling than other stations, as it’s much closer to having maxed out its zoned capacity, and transfers there will always lag behind UW for geographic reasons. Downtown: ULink has been a boon to the non-Westlake downtown stations too. While Westlake boardings are up 41%, boardings are up 82% at University Street, 80% at Pioneer Square, and 70% at International District/Chinatown. Stadium/Sodo/Beacon Hill: Both Stadium and Sodo still have low ridership outside of event times, but boardings are up by 50% at each station, to 1,900 per day. With event riders from UW/Capitol Hill boosting the average, Stadium is also no longer the least-ridden station. Meanwhile, Beacon Hill is enjoying 20% growth, likely a mixture of continued organic growth and riders choosing Link to Capitol Hill over Route 60. Rainier Valley: Ridership in the valley is mostly flat, with Mount Baker and Othello basically unchanged over a year ago. Columbia City and Rainier Beach have both grown by 25%. Columbia City has the highest ridership in the valley, with 2,300 boardings per day, while despite its growth Rainier Beach still slipped to become the least-ridden station, at just 1,800 boardings per day. South King: Ridership at Tukwila International Boulevard is up a modest 7%, with further growth likely curtailed by no new bus service, a very low density station area, and maxed out parking. Meanwhile, SeaTac/Airport grew by 9%, from 6,200 to 6,800 boardings. By now you will have heard that Sound Transit 3 (ST3), the 25-year, $54 billion transit expansion plan, is headed to your November ballot. The Sound Transit Board unanimously approved the System Plan yesterday afternoon, without a whiff of the controversy surrounding the ST2 vote, when last-minute antics and 2 ‘nay’ votes ruffled feathers and raised temperatures. No, the only thing missing from yesterday’s exercise in contentment and mutual congratulation was a round of hand-holding and Kumbaya. Which is stunning, because ST3 is simply without precedent in North America. ST3 will ask you this November whether or not you want 58 more miles of 100% grade-separated rail. Nothing of this scale has ever been proposed in North America. That is not necessarily a compliment, but merely a statement of fact. Consider our peers. As I wrote two weeks ago, there are many boxes in which U.S. transit expansions fit. There are the mature systems with high-quality rail that expand slowly if at all, and struggle to maintain themselves (New York, Boston, Chicago, and Washington DC). There are those who build high-quality lines at low frequencies, and seem ever more eager to extend them rather than invest in the city (looking at you, BART). There are all the second-generation systems that build low-quality at-grade rail in the heart of their cities, often dependent on cheap legacy freight corridors (Portland, Denver, Minneapolis, Dallas, Houston, etc). There are bait-and-switch agencies that passed big capital measures but then spent all their money without actually building their lines (cough, Miami). Even our closest peer, Los Angeles, is hinging its $100B Measure R2 plan on tens of billions in highway tunnels. We’re the only high quality, all-transit game in town. ST3 is different in many respects. On the good side, it cuts no corners and offers 100% grade-separated rail. It forgoes the surface-running operations so tempting to other agencies. It builds a second subway in a town of less than a million people (though not for long). And it will run with longer trains and at higher frequencies than any light rail peer. We already carry 80% more riders per mile than Portland, for instance, and that disparity will only grow with ST3s buildout. On the questionable side, ST3 is also a grand experiment in linear, suburban rail. Building high capacity, high frequency interurban rail to Tacoma and/or Everett is similar to building DC Metro all the way to Baltimore, or building DART from Dallas to Forth Worth, something neither agency would ever propose. The length of the spine is enormous, and presented sufficient operational challenges that Sound Transit chose to split it in two, with Tacoma trains headed to Ballard and West Seattle transit headed to Everett. There is both principled opposition to such a scheme (as in the BRT optimization crowd), and disingenuous opposition (as in the Smarter Transit astroturf group now forming, or the John Niles-esque criticisms that ST can’t be trusted because of rounding errors in ridership forecasts two decades ago). But though the quality of the Seattle projects is undisputed, what are we to make of the suburban rail? Though much has been made of the longer travel times between, say, Tacoma and Seattle (around 75 minutes), it’s worth noting that most quality rail systems don’t even attempt to be competitive with motor vehicles. The Piccadilly Line in London takes 90 minutes to go the ~35 miles from Cockfosters to Heathrow. Chicago’s Blue Line takes 75 minutes to travel the 27 miles from Forest Park to O’Hare. New York’s A-Line takes 2 hours between Inwood and Far Rockaway. So competitiveness with theoretical express buses or SOV travel times isn’t necessarily a prerequisite for highly successful rapid transit lines. But you know what is? Sufficient density to maximize turnover at all points in the system, spread out crush loads, and maximize ridership and operational efficiency. Personally, my assessment of ST3 largely depends on three things: the quality of its urban projects, the prospects for ‘second-city’ revivals for Everett and Tacoma, and density in intermediate suburbs. I am far more confident in the first than I am the other two. Given our far-flung but historically urban cities (Everett and Tacoma) and their decidedly low-density suburban intermediaries, it is clear that ST3 is a grand experiment in inducing this kind of density rather than responding to it. Some suburban cities are doing very well in this regard, especially Lynnwood, while others (such as some South King County cities) have preferred to spare the odd McDonalds on SR 99 rather than build the train where it’d be most useful. While Seattle is building a decent amount of housing, we’re still falling behind, with 1 unit being built for every 3.5 people who move here. Therefore, rapid transit to the suburbs will become increasingly essential for the daily functions of the city. So we’ve got 5 months to think and argue before we give our assent or dissent. But let’s not forget the sheer ambition and breadth of this package, a package that will gauge the American appetite for a fundamental reset of regional travel patterns. Even if you don’t think it builds the right places, you have to grant its quality and scope. And though there may be many principled objections, I think that “What’s your alternative?” is a pretty high bar to clear. What is there about waiting, or not building, that would tangibly make things better? If your argument is that the suburbs get something too nice for their own money, you’re unlikely to get much of a hearing. If your argument lies on the basis of fundamental governmental changes or capture of suburban money for urban projects, don’t expect to be taken seriously. With daily examples of BRT dilution, you’re unlikely to win a technical argument for BRT superiority, even if you have the theoretical facts on your side. For this region in this time under these governmental structures, this is what ‘going big’ looks like. We’ll either make a huge splash with a “Yes’ vote, or face plant with a 4th failure at the ballot box. I certainly prefer the former, but it’s up to you. There are several regional awards for transit-friendly employers, which usually recognize their implementation of programs that subsidize commute modes other than driving alone to work, or provide some other amenity or scheduling framework that supports car-free commuting. And that’s great, because there should be incentives for pro-social policies. However, the best pro-transit policy is to choose a location that has good transit service in the first place. Cut-price transit passes and shower facilities only do so much if employees have to pay an enormous time penalty when getting out of their cars. If you’re an employer interested in attracting talent that doesn’t want to stare at taillights all day, here are some recommendations from your friendly local transit experts. The criterion here is how much of the region is reachable with minimal time penalty over driving. If your employees want to live in Ballard or Capitol Hill or Puyallup or Bainbridge Island, can they get to your office in a reasonable amount of time or not? Since Seattle lies at the center of the region, its best-connected neighborhoods are among the most accessible ones. And of course, to be on this list there has to be an appreciable amount of office or industrial space. 10. Northgate. The minor office park district just south of the Northgate Transit Center is already a hub for bus service for prosperous North Seattle, including the freeway express #41 to Downtown. 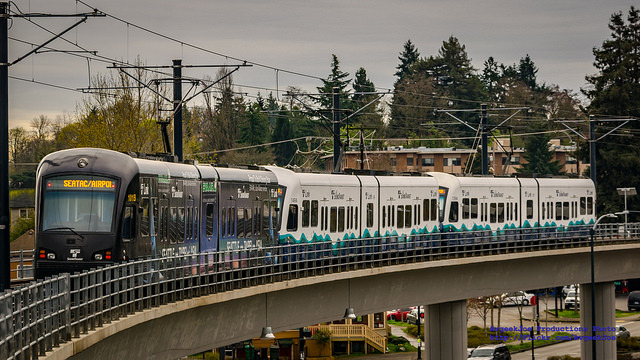 It’s also six years away from light rail, which will provide very quick connections to points in Central Seattle and the Eastside, and later will stretch into Snohomish County. 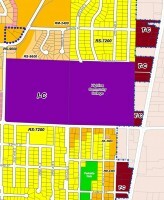 The City also has ambitious plans for more commercial development here. If making a long-term siting decision, Northgate moves up a bit on this list when Link offers an alternative to the daily nightmare on I-5 reverse-commute to downtown. 9. Rainier/I-90. The modest commercial district strung along Rainier Avenue on either side of I-90 also surrounds the intersection of a very intense-yet-slow transit corridor (Rainier) and an intense-and-fast express bus corridor (I-90) with rapid, frequent connections to the downtown hub and the Eastside. In 8 years, Link will improve connections to the Eastside and transform its relationship with North Seattle. Later this spring Sound Transit will release the Final Environmental Impact Statement (EIS) for the Link Extension between Angle Lake and Federal Way. From the draft EIS, only one thing seems certain, namely that there will be a minimum of 3 stations, generally in the vicinity of Highline Community college, S. 272nd St, and Federal Way TC. Everything else is still quite up for grabs. Once the EIS is released, the Sound Transit Board will select a preferred alignment to proceed to preliminary engineering. Alternatives include SR 99, I-5, Sr 99 to I-5, and yes, SR 99 to I-5 to SR 99 (see below). The choices that the ST Board makes on these alternatives will tell us a lot about their values, how they see the role of transit in their communities, and how they view the core function of Link. Is the purpose of Link to speed trips along ‘the spine’, providing competitive options for long trips such as Federal Way-Seattle and (eventually) Tacoma-Seattle-Everett? Or is the goal to provide fast, reliable, local connectivity that maximizes development opportunites? 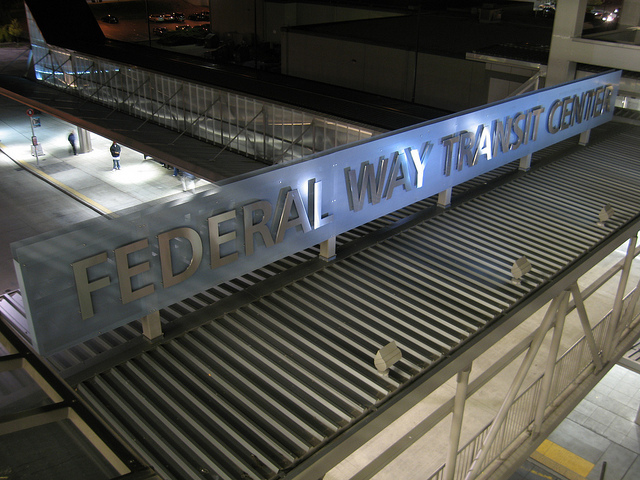 If the former, then Federal Way Link will be designed for disappointment. 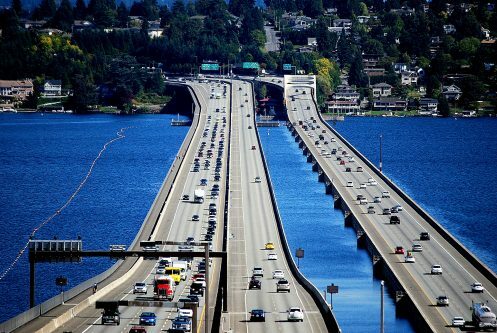 If there were still a possibility of competitive travel times from Seattle to Federal Way and Tacoma, an I-5 alignment would be more defensible. But that ship has sailed, as the MLK alignment of Central Link forever precludes it. So if Link is worth building in South King County, it’s worth building for other reasons than endpoint speed. 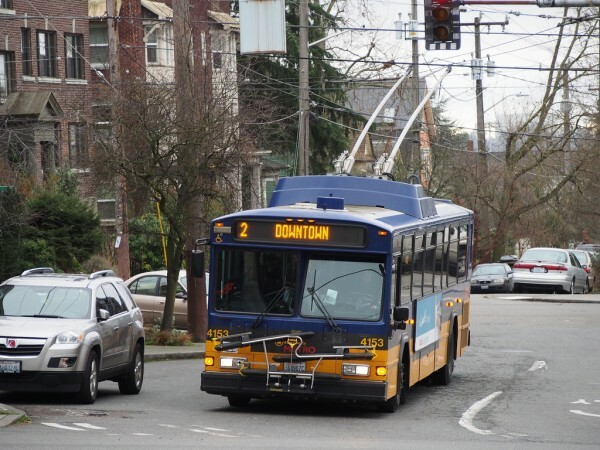 The ST board should be asking themselves, “What are those reasons?” An I-5 alignment with 2.5 mile, anti-urban stop spacing would shave a few minutes of travel time for long trips that would still be uncompetitive with express buses, all while providing the least local benefit to South King County residents. It wouldn’t be terrible, but it would do nothing well. Table by the author, and its approximations are unofficial and for rough comparative purposes only. 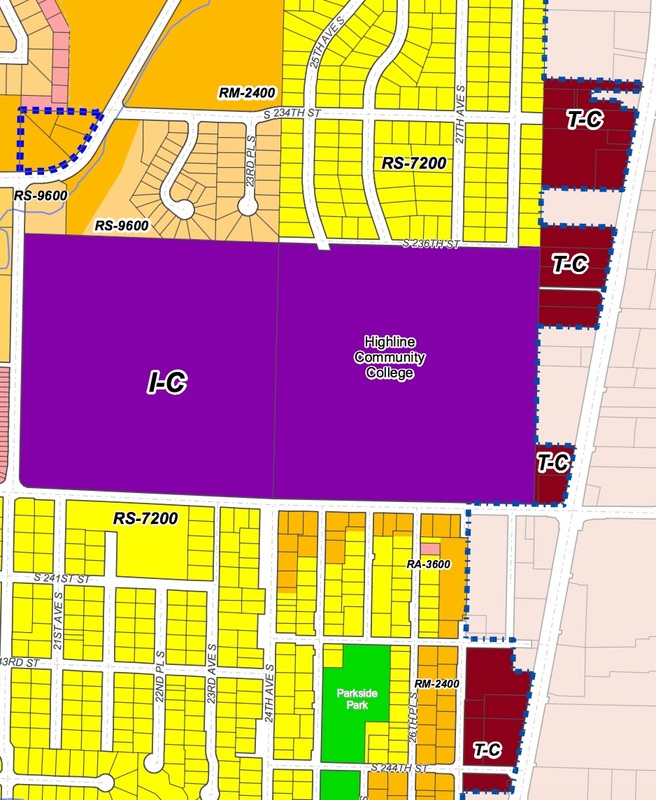 When it comes to zoning, suburban cities have shown themselves more than willing to upzone station areas (see maps below). In 2012 Kent and Des Moines jointly created “Transit Community” zones that anticipated Link service more than a decade in advance. Providing for height minimums of 55 feet and maximums of 200′, these proposed densities exceed anything being considered on Capitol Hill. In Federal Way, even absent any planned rezones, the SR 99 corridor contains most of that city’s current multifamily housing. By contrast, any I-5 alternative not only cuts every potential walkshed in half, but also has far inferior existing land uses, from single-family homes, land-gobbling interchanges, freeway tree buffers, and sprawling industrial land. In short, if suburban cities such as Kent are willing to aggressively upzone station areas and are asking for more stations rather than speed, the ST Board should listen to them. 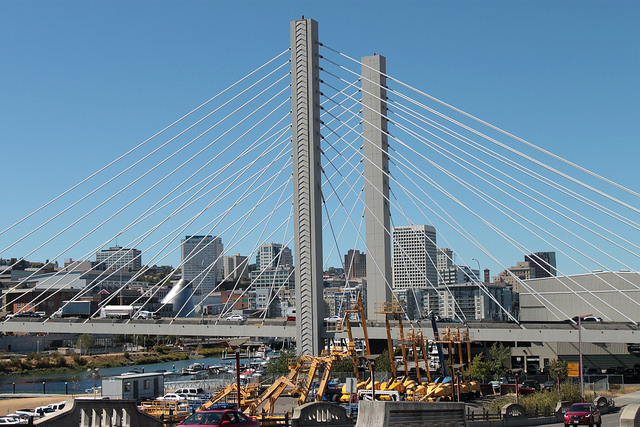 An SR 99 alignment turns a potential regional boondoggle into a local boon. It could cut travel times in half compared to RapidRide A, run 50% more often, provide nearly limitless opportunities to transform auto-oriented (but beautifully linear!) commercial sprawl into TOD, and provide badly needed affordable housing for tens of thousands of people priced out of Seattle. Local mobility is social justice. Let’s maximize it. Thank you to everyone who filled out the reader survey. It gave us several insights into how we can improve the site, but mostly it served as morale-boosting encouragement that we’re doing something that people find valuable. If any STB staffers actually are demonizing people for driving cars and living in detached housing, then they are stinking hypocrites. Partly because car ownership and single-family residency are far from uncommon in our ranks; but also that the entire premise of Seattle Transit Blog is that the region has done a poor job of prioritizing transit so that dense living and transit dependence are widely appealing options. More broadly, I believe people respond to incentives and make decisions in accordance with what they value. It’s easy to criticize a giant truck for its carbon footprint, but like anyone raised Catholic I know we are all sinners here. Some of us fly all over the world for leisure, some eat more meat than is even healthy, and some of us burn a little extra gasoline. Who am I to judge which impactful choice gives you the most pleasure? This empathy does not extend to people who seek to use regulatory power to control the choices of others. Campaigns to ensure that no one in search of compact, inexpensive housing can live in a certain neighborhood is well beyond the exercise of personal freedom. Making thousands of bus riders wait in traffic, or bicyclists risk their lives mixed with cars, just to cheaply store a car in public right-of-way is a remarkable indifference to the well-being of others. So by all means, if it works for you please keep living in your detached house and driving your car everywhere. But please recognize that policies that discourage or prevent other choices are bad for sustainability and for freedom. Dan’s report on the Senate Transportation agreement illuminated poorly understood numbers associated with potential Sound Transit 3 taxes and project budgets. In spite of his noble efforts to explain it, there is evidently quite a bit of confusion remaining. There are two separate planning processes that both have a $15 billion figure in them, and both are expressed in Year of Expenditure (YOE) dollars, but they aren’t directly related. The first is a tax plan. Sound Transit asked for enough authority to levy as much as $15 billion over 15 years from sales tax, property tax, and Motor Vehicle Excise Tax (MVET). Although it’s conceivable they can use the full amount in a 2016 ballot measure, it’s scaled for flexibility both in the overall package size and in the mix of taxes, so that the Board can optimize chances of a successful vote. The second is a 15-year project list and budget. The Board used a $15 billion capital program as an example, chosen somewhat arbitrarily from the size of Sound Transit 2. Because any program would include lots of bonds, a given 15-year tax package size funds a larger capital program. ST spokesman Geoff Patrick gave the example that $9 billion of taxes funds $15 billion of projects. Bus 2, waiting for yet another red light. By Neil Hodges. As it has for many years, Bus 2 comes every 15 minutes during the day, and every 30 minutes nights and Sundays. Almost every trip on Bus 2 is full between downtown and Virginia Mason, where approximately half of its passengers are headed at most times of day. The passengers are a mix of old Seattle, new Seattle, and everything in between. Bus 2 is a microcosm of its changing city, encompassing in its 40 feet all the decades it has spent trundling back and forth. The remaining passengers leave in a steady trickle between Boren Avenue in First Hill and MLK Jr. Way in the Central District. Few people use Bus 2 in Madrona or Madrona Park. But the driver does get to enjoy Metro’s most scenic layover, at the lake’s edge, if Bus 2 is on time. Bus 2 is rarely on time, except late at night. The most heavily used part of the route, the seven-block stretch between Virginia Mason and downtown, is often seriously delayed by traffic congestion, especially eastbound toward the hospital. 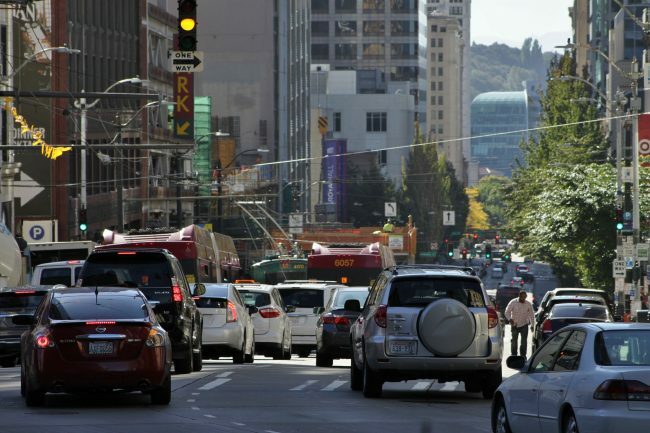 Every rider of Bus 2 knows the drill of sitting through multiple cycles at each traffic light along Spring Street, stuck behind cars trying to get onto southbound I-5 at 6th Avenue. Depending on time of day, the entire three-and-a-half-mile trip is scheduled to take anywhere from 23 to 36 minutes, for an average speed of five to seven miles per hour — and that’s after waiting for the bus. The result: Bus 2 gets its riders where they want to go, but slowly, often more slowly than walking. Other Metro bus routes, also traveling east and west, overlap with the parts of Bus 2 that nearly all of its riders use. Route 12 runs along Madison Street, within two blocks of Bus 2 all the way from downtown to 17th Avenue. Routes 10 and 11 run along Pine Street, two to four blocks away, as far east as 15th Avenue. All three of these routes are a very short walk from Bus 2, although none serves Bus 2’s exact routing. All of them are faster, and more reliable, than Bus 2, mostly because traffic moves faster along the streets they serve than it does on congested Spring and Seneca. And yet lots of reasonable people ride, and love, Bus 2. Trying to improve it, even with all its flaws, is a big deal. And the process can be done better. More after the jump. Twice in the last two weeks, I’ve been a passenger on buses that passed up other passengers while there was still room in the back of the bus. Two weeks ago, I got on a bus after the driver was telling other riders it was too full, because I saw open space in the middle of the front half of the bus, and pushed my way back there. Especially in horrible November and December weather, things like this shouldn’t ever happen. And the reason they do happen is oblivious or rude standing habits. To be considerate when you’re standing, all you need to do is follow three simple rules. Please pass this post along to everyone you know who rides well-used routes, so more people can get on without someone making a scene. Really. Move back. Yes, all the way back. Yes, further back than that. This is the most important rule. And it’s that simple. A typical scene on a morning Route 312 trip. Note the fantastic view I have, because I’m standing in the elevated area at the very back, where more people need to stand. Also notice the guy in the black parka who refused to move further back even as we passed up passengers at NE 85th. The passed-up passengers should make and use voodoo dolls of that guy. 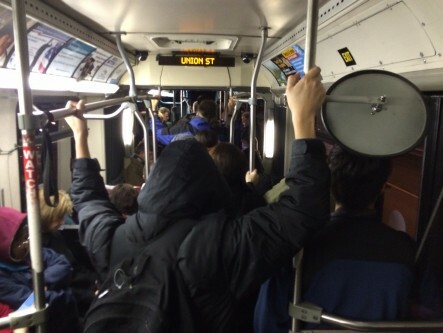 There is not a spike that descends from the very back of the bus to impale you if you stand all the way back. I often see otherwise jam-packed buses with absolutely no one standing to the back of the rear steps. Please stand back there. You can still reach the door easily, you have a nice view past other standees in low-floor buses (as in the photo above), there is plenty of headroom unless you’re well over six feet, and you’re considerately making room for others. Three to four people can comfortably stand behind the rear door, and you can jam six or seven in when it’s extremely crowded. Other places where people are very reluctant to move back are at the hinge and, bizarrely, at the front door. Yes, you need to move past the hinge if there is room in the back half of the bus. And if you are that person who insists on standing at the front door and forcing everyone else to dance around you just to get on, then you deserve all the bumps and bruises you get. You will still be able to get off the bus just fine if you move further back. Frequently, standees will tune out the world around them as soon as they’ve settled into a position, not noticing that people behind them have considerately moved back because more people want to get on. When the bus stops, look around you. Look both backward, to see if you have more room to move back, and forward, to see if more people are trying to get on. People sitting in full buses should also pay attention, because they should be ready to give up their seats to seniors or persons with disabilities who may have a hard time standing in a moving bus for the length of the trip. Getting totally lost in your reading, music, or game is fun, but rude to those around you. If you are standing near the doors and passengers are trying to get off, then get off the bus, and step back on when people finish exiting. People can exit much faster when the aisle is clear, saving everyone time. You will have time to get back on. Drivers will wait until they see no movement at the back door to close it, and they can tell the difference between existing passengers getting back on after having stepped aside and new passengers trying to evade payment. If all standees followed these three simple rules, we’d have considerably fewer pass-ups, and buses would move faster as well. Please be considerate to your fellow passengers and stand the right way. Those waiting in the cold and rain at bus stops thank you sincerely. 2000 USA Population Density by Dave Walbert. Growing up in the United Kingdom, a country with passenger trains radiating from or converging on the capital every 30 minutes or better in all directions until late in the evening, I’ve never quite been able to wrap my head around the American conversation about intercity rail. There seem to be essentially two camps, the conservative “Amtrak is a money-losing boondoggle, sell it off stat”, and the “Every train is sacred” liberal camp fighting to preserve what we have today; Eric Jaffe’s post today over at Atlantic Cities was an effort in the latter camp. Alas, I can find no organized group of people saying, “Let’s figure out what works and what doesn’t, double down on what does and abandon what doesn’t”. Some basic geometric facts: Intercity rail in the UK works because of the 63 million people in the country, 53 million of them live in England, an area about 16% smaller than the US state of Georgia, or 30% smaller than Washington, which has less than 7 million; most of the rest live in a small belt of Scotland or a pocket of Wales. There are therefore nearly an order of magnitude more people within a distance of each other that can be traveled by rail in a time competitive with flying. Only two places in the US offer this kind of aggregate mega-regional density, which is essential to sustain a network of intercity trains at a reasonable level of public subsidy: the North East Corridor, possibly extended west out to Chicago; and the coast of California from San Francisco to San Diego. In other places, individual city pairs could make sense (e.g. Portland – Seattle), but those will always be A-B(-C) lines, not part of the network where you can travel widely. My understanding is that the real reason to run the long-haul trains at taxpayer expense is to touch enough states that most of Congress can feel good about Amtrak in general. The other arguments presented here sound largely rhetorical. Ridership may be rising but it’s a long way from profitable or even a reasonably level of subsidy per passenger. “National rail network” sounds like rhetoric without content. Rail is optimal for particular distances. Europe has lots of great rail services, but still, if you’re going 2000 miles within Europe, and you’re not a tourist or time-rich wanderer, you’re definitely going to fly. Australia has a “national rail network” made of long-haul trains traversing comparably vast distances. But they’re run by the private sector with fares set to ensure profit based on an explicitly tourist intent. Australians think of them (accurately) as beloved tourist trains that everyone must ride once in their lives, not as a “national rail network”. Australia is too big for rail networks to be national, and so are the US and Canada. It may be that by touching so much of the country, the long-hauls are playing a crucial role in maintaining national support for Amtrak, both in Congress and among the population. But if we over-hype them we just sow confusion about what really successful rail lines look like. If some segments of long-hauls show so much ridership that they need more local frequency (e.g. Minneapolis-Milwaukee-Chicago), then target those corridors for more frequent shorter-haul trains. But I’m puzzled by what national interest is being served in one train a day for Fargo, ND, passing through between 2:00 and 4:00 AM. States and compacts of neighboring states must be the leaders on intercity rail, because they exist at the scale where rail can actually succeed. Ultimately, you’re either into transit advocacy as a workable alternative to car ownership for working adults who can’t spend three days to get from Seattle to Phoenix, or you’re into it because “Yay, trains!” I’m in the former camp. As SDOT and Sound Transit have begun to study the possibilities for improving transit between downtown Seattle and Ballard, the idea of a new Ship Canal crossing in the vicinity of Fremont has lately been discussed extensively but informally in transit circles. That discussion became a little more public on Wednesday, when the Mayor’s office, along with transit, freight and bicycle advocates, held a press conference asking the City Council to fund a proposed study of the idea. The concept has been around for a while, making its most recent public debut in the 2012 update of the Transit Master Plan. Like several of the capital projects in the TMP, the Ship Canal crossing idea seems rather obviously inspired by our neighbors to the south, in Portland. As part of the the MAX Orange Line, TriMet is currently constructing a crossing of the Willamette river that will carry light rail trains, buses, emergency vehicles, bicycles and pedestrians, and (eventually) streetcars. Perhaps for that reason, most thought and discussion of a crossing (including mine) defaulted to the assumption that it would be a transit, pedestrian and bike crossing, west of the current Fremont Bridge. Then, late last year, someone relayed to me a better idea that, once I heard it, seemed absurdly obvious and considerably superior. It begins with the quite pedestrian observation that minimizing travel distances is much more important for people walking and biking than any other mode. Asking someone to take a quarter- or half-mile detour in a car just means they would have to watch the world scroll by for an extra minute or two, but asking someone to walk that distance is maybe five to ten minutes of their time. As almost all transit riders are also pedestrians when they’re getting to or from the service, it’s thus much more important for transit to directly access the heart of ridership centers and transfer points than for cars; and similarly for bicyclists. The chronically congested Fremont Bridge is perfectly located to maximize access to Fremont, and to minimize travel distances between almost any point on the west or south side of Lake Union and any point north or northwest of the lake (without building an extremely long bridge). 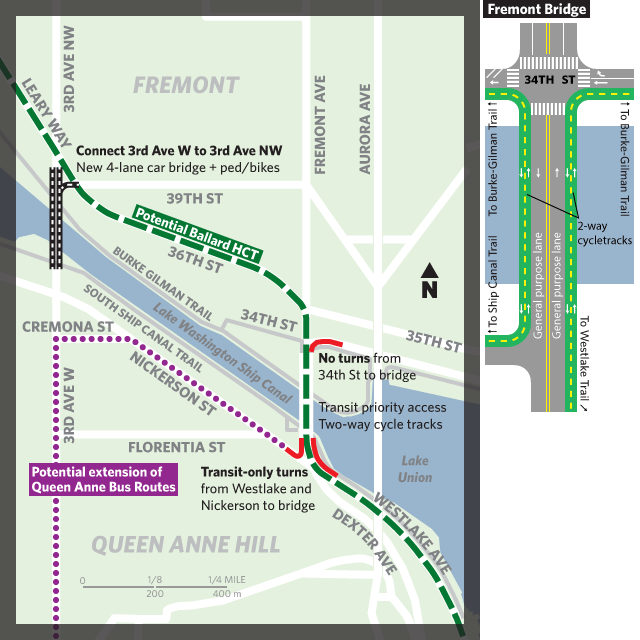 Perhaps rather than looking to take transit, bikes and pedestrians out of Fremont, we should be looking to prioritize them on the Fremont Bridge, and find a way to get the cars out of Fremont. We could turn the original idea on its head: build a new road bridge west of Fremont (complete with excellent bike and pedestrian infrastructure) and reconfigure the Fremont Bridge to primarily move people, not cars. The map and diagram above, by Oran, illustrate one possible implementation of this idea. After the jump, I’ll discuss all the components in detail. Every so often, I’m asked why I care so much about Metro, writing at possibly-exorbitant length about everything from huge structural changes to the bus network, to minutiae like pointless crossbucks and crazy vestigial terminal loops. With about the same frequency, I overhear transit advocates suggest that going into bat for better bus service isn’t worth the effort, because, well, it’s hard, progress is slow, and anyway we’re going to build rapid transit and then we can “forget Metro” or something to effect. I encountered some of this at the Ballard High Capacity Transit open house, and I want to address it. Think about any first-world city, which exists in a comparable political culture to that of the US, and that’s generally regarded as having good transit, given its size and density: for example, London, Boston, New York, Vancouver, BC. These cities are rightly known for their rapid transit systems, which in many cases have become not just part of the city’s identity for residents, but an iconic part of those cities’ presence on the world stage. But all of them also have an unsung, yet crucially important bus network that, overall, usually hauls more passengers than the rapid transit network. For example, Translink’s 2011 bus ridership exceeded its SkyTrain ridership by about 70%, and bus ridership will likely remain about 40-50% higher even after the Evergreen Line and UBC-Broadway Corridor are built out. These buses facilitate trips that aren’t possible, or would be slower or less convenient, on the rapid transit network, because no city has infinite money to cover all its densely-urbanized parts in rapid transit, and most rapid transit systems, of necessity, trade off some amount of local access for speed, by having stops outside the city center spaced further apart than many people can (or want to) walk. To the people behind these excellent transit systems, the bus network is absolutely not an afterthought, or something they are just keeping alive until they criss-cross the city with trains. You can see this in Translink’s great network maps and seamless bus-rail interfaces at every SkyTrain station; and Transport for London’s design and purchase of a unique and beautiful model of double-decker bus for London, and implementation of a cashless zone and extensive network of bus-only lanes in the city center. “I think frequency is an overrated thing. Let’s say there’s a 20-minute [wait]. You can look on your phone, wait inside and have a beer.” — Portland Streetcar Citizens Committee member Peter Finley Fry, justifying the 18-minute frequency of the Portland Streetcar’s new Eastside loop, quoted last August in Willamette Week. I don’t mean to pick on Mr Fry — I’m sure he is a person who sincerely wants to make transit in Portland better, and thinks he is doing so — but this quote is perhaps the crowning example of an incredibly misguided, but surprisingly prevalent strain of thought among the political leaders, advocates and managers of transit systems in the northwest; one which, until we slay it, guarantees we will flail ineffectually (and at potentially great cost) in our efforts to provide an alternative to near-universal car ownership by working-age adults. The highway engineers, social engineers, and car manufacturers of the 1950s, who overthrew the entrenched dominance of public transit virtually everywhere in the United States, used many different tactics and appeals to do so, but one thing they certainly didn’t do was tell people they would have to wait 15 or 20 minutes before they could start their journey, so they should just cool their heels and read the newspaper for a bit. Quite the opposite: they promised freedom to travel where and when you wanted. If we wish to emulate their feat, and install transit as the (vehicular) mode of choice in the dense parts of our cities, we need to internalize their language, their promise (go where you want when you want), and a proper understanding of how frequency affects travel time for spontaneous trips within a city. On transit, if you wish to travel spontaneously, or arrive at a particular place at a particular time, the average delay is half the headway. At 18-minute headways, that’s nine minutes of expected delay.